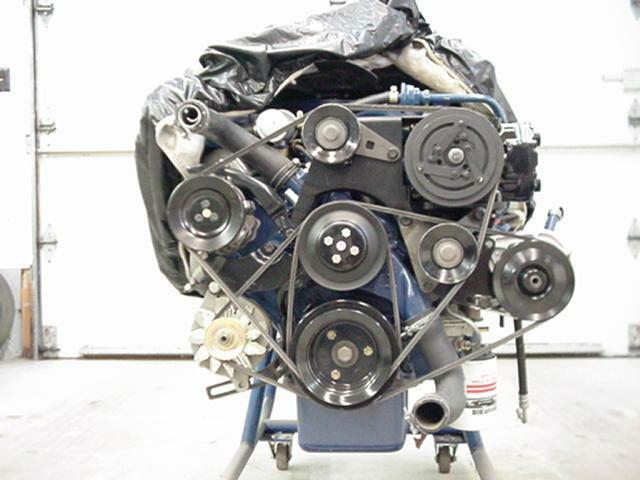 This page contains application and service part or engineering number descriptions for the many accessory drive belts used on 428 CJ and SCJ Mustangs. Much of the information listed here has been gleaned from build/broadcast sheets, master parts catalogs, and ongoing discussions with people who work with these parts for a living. Sorry, I don't have any pictures of original belts, but I do have pictures of correct belt routing -- see below. Please note that the engineering part numbers you see listed here may be different from the numbers you see in vendor catalogs or the 1975 Master Parts Catalog. Where possible, I list engineering numbers from original build sheets and earlier MPCs. Most, if not all, of these belts are available in reproduction. Replacements are also usually available from the aftermarket at your favorite local parts store. Alternator (two sheaves), water pump (three sheaves), smog (one sheave), and crankshaft (two sheaves): Two belts on the crankshaft pulley drive the water pump and alternator pulleys. A third belt drives the smog pump pulley from the outermost of the sheaves on the water pump pulley. Alternator (two sheaves), water pump (three sheaves), smog (one sheave), crankshaft (three sheaves), and ps (one sheave): Two belts on the crankshaft pulley drive the water pump and alternator pulleys. A third belt drives the smog pump pulley from the outermost of the sheaves on the water pump pulley. A fourth belt drives the power steering pulley from the outermost of the sheaves on the crankshaft pulley. Alternator (two sheaves), water pump (two sheaves), smog (one sheave), crankshaft (three sheaves), and a/c (one sheave and two idlers): Two belts on the crankshaft pulley drive the water pump and alternator pulleys. A third belt drives the smog pump and a/c pulleys from the outermost of the sheaves on the crankshaft pulley. Alternator (one sheave), water pump (two sheaves), smog (one sheave), crankshaft (three sheaves), ps (one sheave), and a/c (one sheave and two idlers): The innermost belt on the crankshaft pulley drives the inner sheave on the water pump pulley and the alternator pulley. 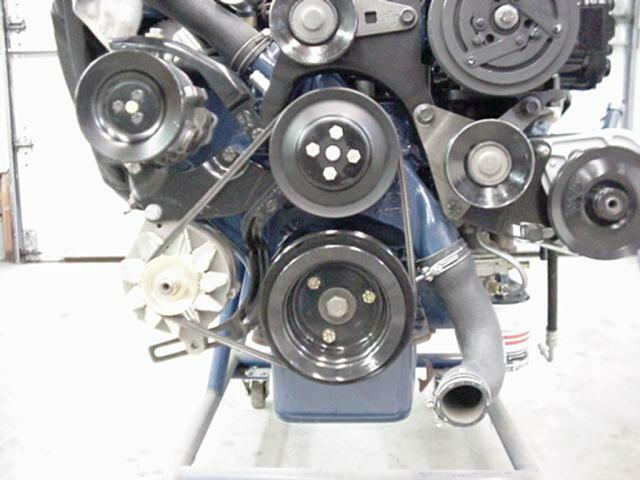 The middle belt on the crankshaft pulley drives the outer sheave on the water pump pulley and power steering pulley. 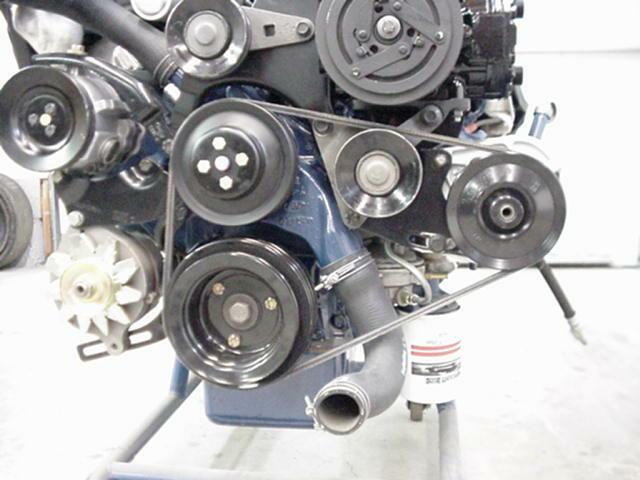 The outer belt on the crankshaft pulley drives the a/c and smog pump pulleys. Right now I only have one image showing correct belt routing. Others are welcome. I know there are drawings in the engine assembly manuals produced by Osborn Reproductions and pictures in some detailing articles that appeared in Mustang Monthly in July 1990, March 1994, and February 2003. The tables below list what I've found by analyzing broadcast (build) sheets for CJ and SCJ Mustangs. Service part numbers are from a 1970 Master Parts Catalog. It's possible that your build sheet might list different belt numbers than what I have listed here. I've seen the occasional build sheet with different numbers (though I have no idea why they might be different), but these represent the majority of what I've seen. Note, too, that some Canadian service part numbers are different in the MPC and those part numbers aren't listed here. 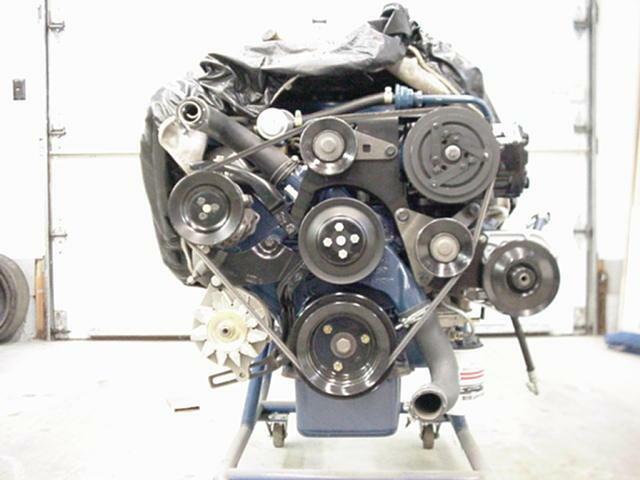 Smog pump belt notes: With a very small number of exceptions the 1969 C5TE-B belt appears to be commonly used in conjunction with the C8OE-A water pump pulley and the 1969 C6OE-B belt appears to be commonly used in conjunction with the C8AE-C water pump pulley. I've only seen a small number of 1970 Dearborn build sheets with the C6OE-B belt, and again those cars were also equipped with a C8AE-C water pump pulley. The latest I've seen has an assembly date of 27H (August 27, 1969). After that date the C5DE-D belt commonly appears with the C8AE-C pulley. I haven't seen any Metuchen or San Jose build sheets that specify the C6OE-B belt for a 1970 CJ. Power steering belt notes: I've also seen a build sheet code of "6VE A" (C6VE-8620-A, C2TZ-8620-AA) on a few 1969 cars without air conditioning. Alternator belt notes: The build sheets that I've seen tend to use different codes for alternator belts than those that I've seen listed in the 1975 MPC. Thanks to Bill Upham for the pictures used here.